We all know the classic Christmas ballet, Tchaikovsky's "The Nutcracker." 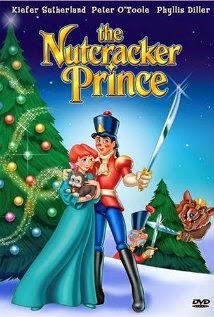 But did you know about the enchanting 1990 animated film "The Nutcracker Prince" loosely based on E.T.A. Hoffman's story, "The Nutcracker and the Mouse King"? It uses music from the Tchaikovsky ballet and features the vocal talents of Keifer Sutherland and Megan Follows. I grew up watching this movie every holiday season, and it's still a favorite for me and my sisters. I have always strongly identified with the protagonist, a young dreamer named Clara (Megan Follows). Her "uncle" Drosselmeyer is an inventor and magician of sorts, and he brings stories and other realms to life for Clara when he gives her a nutcracker shaped like a soldier and fills her in on the gift's history. If you haven't seen the movie, I highly recommend it. The animation is ... well ... 1990 animation, but that aside, it's a beautiful, imaginative story with lots of color, humor and joy.